Research shows that creative expression throughout life — especially later in life – can be extraordinarily fulfilling and result in increased vitality and better health. 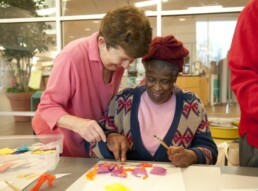 AFTA trains and supports a faculty of professional teaching artists who lead customized workshops for groups of older adults in partnering community and residential care settings, focusing especially on those living with aging-related health impairments. 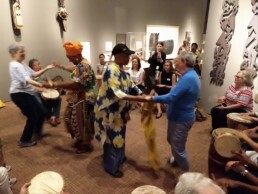 Your generous gift to Arts for the Aging, Inc. will combat isolation and spread joy and better health to seniors by providing them with regular engagement in participatory visual, musical, performing, literary, multidisciplinary, and intergenerational arts experiences. Make a gift of long-term appreciated securities or by naming Arts for the Aging as a beneficiary in your will. For specific instructions for your broker, please contact AFTA at info@aftaarts.org or 301-255-0103. Individuals or couples who include AFTA in their estate planning will be recognized as members of the AFTA Legacy Society. For more information, please contact AFTA at info@aftaarts.org or 301-255-0103.